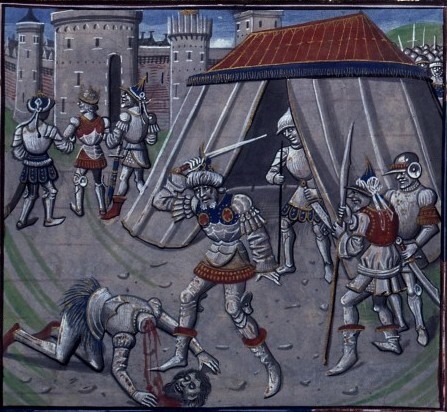 On this date in 1187, Saladin dealt the Crusader Kingdom a crippling blow at the Battle of Hattin — and a fatal beheading to douchebag French knight RaymondRaynald of Chatillon after the fray. Saladin personally administered the chop. That’s a weight off his shoulders. Conduct so ill comporting with Saladin‘s reputation for chivalry had been earned by Raynald’s own bad behavior. Crusaders with a view to realpolitik saw that the Kingdom of Jerusalem had to coexist with its Muslim neighbors. Raynald (or Reynald, or Renaud) just preferred killing them. His raids against Saladin’s caravans when the Crusader state was supposed to be at peace with the Ayyubids precipitated the war that would claim his own head — and, within three months of this date, Jerusalem itself. In your first paragraph you seem to confuse Reynauld with Raymond of Tripoli, or is that a typo? Great story, interesting that you left out the part where Reynauld had previously defeated and humiliated Saladin some years earlier. Though I suppose there are so few gallant Mohammadans that you try to keep Saladin’s name as noble as you can. As to the other two comments, you are talking about a man of humble beginnings who rose to great heights on his own determination and courage. Reynauld De Chatillon was one hell of a man. Great comment from such a bigot you’ve just shown yourself to be . . .
Renald de Chatillon as far as I am concerned got off easy , it is said, and I believe to be true, is that Renald had very light blonde hair, and that it was reddish-orange from the constant blood staining his hair. I am a native American, and we had very specialized punishments for the murderer’s. We lit a very small fire, tied the offender’s head over this small fire until their brains boiled in the skull it took about 4 to 6 hours to complete , longer if the hair was cut off or yanked out by the people when they walked the line. Alhamdulillah. One of the items plundered by Raynald was a golden Quran. It was never returned. It made its way to France…but was not discovered until today.